History accords the Mughals a special place, both as a memorable dynasty that left remarkable edifices but also as one that ruled over much of India. Only the British managed to control more land and even Ashoka the Great did not extend his empire into south India. 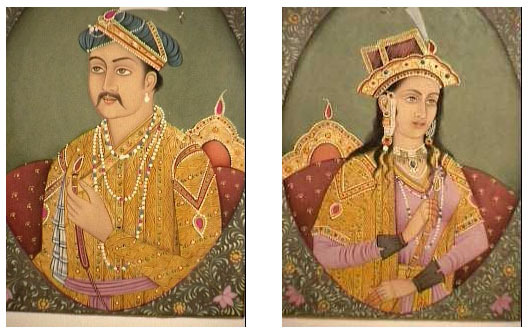 A notable contrast with the British (and the other European colonial powers) however, is the fact that the Mughals also absorbed Indian traditions and especially Akbar also tried to synthesize an amalgam of Indian and Mughal life styles. 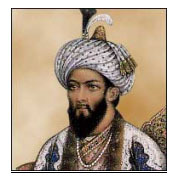 The founder of the Mughal Empire, Babur (Zahir-ud-din Muhammad) was a descendent of both Timur on the paternal side and Genghis Khan on the maternal side. He was the ruler of Kabul while Sikandar Lodi built the new city of Agra. Babur had attempted to invade India five times but only succeeded in 1526, at the Battle of Paniput. There he defeated the Sultan Ibrahim Lodi and set up the new empire. 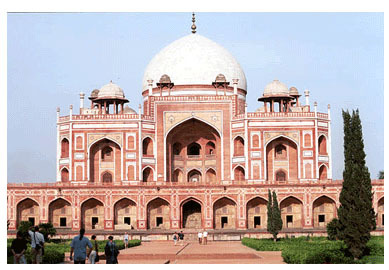 He sent his son Humayun to Agra, the capital of Sultan Lodi to capture the palaces and treasures of the Sultan. Within two years of ascending the throne Babur consolidated his rule by first defeating a confederacy of Rajput kings led by Rana Sanga and in 1529 by defeating the forces of both Bihar and Bengal on the bank of Ghagra. He extended the empire from Kabul to Bihar and the Himalayas to the River Ganga. In 1530 he died and was buried in Kabul. Nasir-ud-din Muhammad Humayun (AD 1508-1556), the eldest son of Babur ascended the throne in 1530 and ruled until 1540. He met defeat at the hands of the Afghan ruler Sher Khan Sur in 1540, at Chausa, between Varanasi and Patna. His army of 40,000 was defeated by a smaller army of 15,000 of Sher Khan Sur Humayun went into exile. He was given refugee in Persia by the Shah of Iran, Shah Tamasp. However, 15 years later he returned and regained the monarchy. His short rule of only 10 years was punctuated by conquests but no artistic or literary accomplishments. That privilege would fall in the hands of his descendants. Akbar, the third Mughal Emperor was only 13 when he ascended the throne upon the untimely death of his father, Humayun. He ruled under the able guidance of Bairam Khan, a prominent nobleman and won a decisive battle against the Afghans. This, the second “Battle of Paniput” assured the continuation of the Mughal Empire. In 1562 Akbar took charge as the Emperor after he removed Bairam Khan from power. For the next 30 or so years he concentrated on expanding the Empire, which meant he was constantly at war. However, when possible he used conciliation and reward for loyalty to gain control of Kingdoms and their land. He also followed an active program of involvement and amalgamation of the various kingdoms, especially of the warring Rajputs. Unlike most Muslim rulers he encouraged marriage between Hindus and Muslims. His favorite wife (first of 33 wives), was a Hindu Princess from Rajput. By the end of his campaign Akbar had extended his empire all across North India and Afghanistan as well as the Deccan in the south. 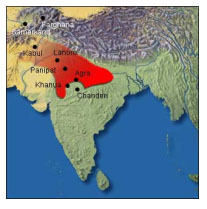 During the early part of his rule Akbar used Nagarchain, a village seven miles to the south of Agra. At the same time he had also revamped Agra by building over 500 masonry buildings. 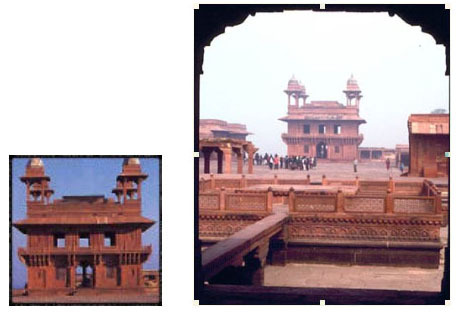 However, in 1571 he moved his capital to the newly built city of Fatehpur Sikri. A crowded metropolis during Akbar’s reign, this city fell victim to lack of planning and was abandoned when water shortage became acute. Akbar is credited with building the Empire into one of the richest in World history and perhaps the wealthiest of the time. Besides his gift of conquests, he was a great administrator and with the conciliatory policies towards the no Muslims, he gained the loyalty of vast majority of his subjects. The liberal bend in his character is amply evidenced by his marrying two Hindu Princesses and then allowing them to practice Hindu religious ceremonies in the Harem. Akbar’s greatest gift and genius was primarily military; thus he built an empire that would engulf almost the whole of India and Afghanistan. Most of the population of India (estimated at 140 millions) were his subjects; compared to this, the whole population of Europe was only 40 Million and that of England only 5 Million. His reforms in administration and taxation were also in part responsible for the sustenance of this vast empire. The abolition of the unpopular taxation of all but the wealthiest of the non-Muslims, his conciliatory gestures to Hindu rulers and even appointing them in senior posts in his administration further improved his credibility among the masses. Finally, his patronage of literature, the arts and music despite his own illiteracy and the balanced treatment of all religions ushered in a period of prosperity rarely matched in Indian history. While Fatehpur Sikri was abandoned as the capital city, its stunning architecture remains a fitting monument to this golden age of medieval India. The influence of Akbar and his successors spanned not only architecture and garden design but the Indian music and cuisine have been transformed forever. Is it any wonder why Akbar is celebrated as “The Great”, a distinction he shares with another Indian Emperor, Ashoka? 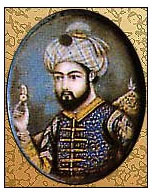 Prince Salim was one of three sons of Akbar, of a Hindu Princess from Amber; the other two sons Prince Murad and Daniyal died early of excessive drinking. During Akbar’s long rule Prince Salim rebelled and exhibited impatience and a struggle took place with his father, the Emperor. Matters were also muddied by the fact that he (Prince Salim) had an affair with a court dancer (of “Anarkali” fame and the basis of the Hindi epic movie “Mughal-E-Azham”). When Akbar died in 1605, Prince Salim ascended the throne and proclaimed himself “The World Conqueror” or Jahangir. The battles for succession in this monarchy started when Salim’s own son Prince Khusrau also vied for the throne but Jahangir managed to prevail. Unlike his father, Jahangir did not have much success in battles, especially in the Northwest although in the Deccan, his armies did defeat Malik Ambar. The task of dealing with Malik Ambar was left in the hands of his third and favorite son, Prince Khurram (later Emperor Shah Jahan). As a result of the able administration of Akbar the Mughal treasury had unlimited funds and both Jehangir and his son Shah Jahan could afford to spend large sums in constructing monuments and gardens. Much of the administration of the empire was left in the able hands of his wife Nur Jahan, her father Itimad-ud-daula and her brother Asaf Khan. 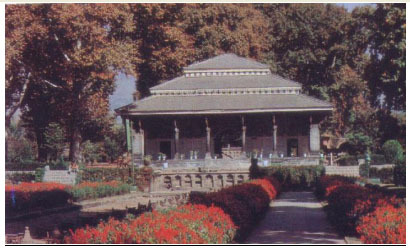 Jahangir spent much of his time relaxing in the famous gardens he built in Kashmir. Unlike his predecessor, Akbar, or his successor Shah Jahan, Jahangir left no lasting relics. 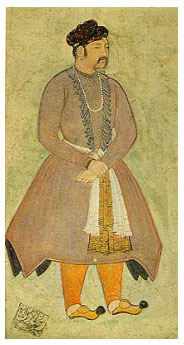 Like his father Jahangir, Prince Khurram was also born of a Hindu princess (Rajput princess Manmati). But unlike his father, there was tumultuous battle for succession between Prince Khurram and his brothers and his brother-in-law (Nur Jahan’s son-in-law) prince Shariyar. On ascending the throne Prince Khurram assumed the name of Shah Jahan (“King of the World”). Having inherited great wealth, thanks to the able administration of his grand father Akbar and to his aesthetic qualities, Shah Jahan set out to build great monuments. 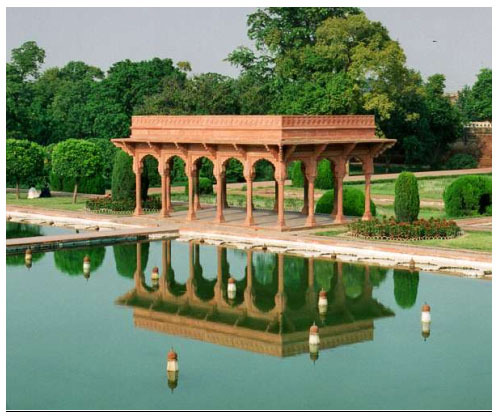 Thus he built the black marble pavilion at the Shalimar gardens in Srinagar in Kashmir, white marble palace in Agra and a large city which he called Shahjanabad in Lahore. However, his greatest achievement was building the world famous Taj Mahal. It was built as a lasting monument to his love for his favorite wife and constant companion, Mumtaz Mahal (Princess Arjuman Banu who was the niece of Nur Jehan). He was devastated when Mumtaz Mahal died prematurely while giving birth to their fourteenth child. At her deathbed she asked Shah Jahan to build the most beautiful mausoleum. Once he recovered from the shock of losing her, the Emperor set out to build this lavish edifice. 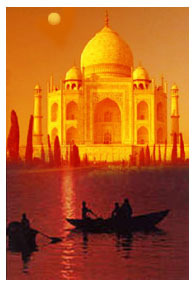 Please refer to the accompanying links to Taj Mahal for details and more pictures. Shah Jahan also built the Juma Masjid and renovated forts in Delhi and Agra. 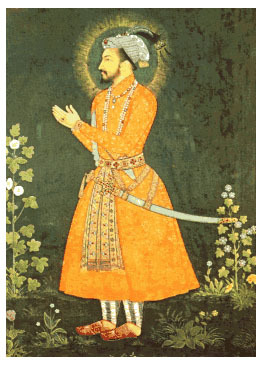 After he was imprisoned by his third son Aurangzeb as a part of his battle for succession, Shah Jahan was kept prisoner in the Agra fort for the last eight years of his life. From there he could gaze at the Taj Mahal. In 1666, at the age of 74, Shah Jahan died and was laid to rest next to his wife. During his reign Shah Jahan did manage to extend the empire to the Deccan. However, his conquests to Afghanistan were quelled by the Persians in Kandahar. Thus the lasting legacy of Shah Jahan was architectural and not the size of the empire or any philosophical or literary achievements, unlike his grand father Akbar. Aurangzeb was acting as Governor of Deccan at the time the power struggle for succession to the throne of the Mughal Empire began. His father, Emperor Shah Jahan preferred the first son, Prince Dara Shikoh. The latter had shown great promise to carry on the enlightened path of his great grandfather, the great Akbar. His potential was amply revealed by him translating the Hindu Upanishads into the Persian language. However, he would turn out to be less able in the battle for succession and Aurangzeb marched from the Deccan, killed all his challengers and ascended the throne. After dispensing of all opposition, Aurangzeb imprisoned his father whom he kept for eight years under house arrest in the Agra Fort. There, Shah Jahan took solace in the fact that he could gaze across the Yamuna River, at the spectacular monument he built for his beloved wife Mumtaz Mahal. Aurangzeb systematically dismantled every gain that his predecessors did in ruling a predominantly Hindu India with diplomacy and conciliation. Thus, during his reign the vastly unpopular taxation system whereby non-Muslims were taxed (“jizya”) was reinstated. Hindu temples and traditions were systematically destroyed with the hope of converting the whole of India into an Islamic state. Where the holiest of Hindu temples were desecrated and destroyed, Aurnagzeb built Muslim mosques. His long reign was bereft of any lasting monuments or architectural achievements that were the hallmarks of the Mughal rulers from Akbar’s time onwards. For over 27 years and until his death Aurangzeb was bogged down in battles in the Deccan. Much effort went into subduing the Marathas who were under the cunning leadership of Shivaji. With able administration and with shrewd military conquests Aurgangzeb extended the empire into Tibet and Assam. But as history would record, through his bigoted actions Aurangzeb presided over the moral demise of this once great empire. In 1707 at the age of 90 he died and another bitter struggle for succession ensued. The victor, Prince Muazzar assumed the name of Bahadur Shah and ruled over the dwindling empire. The last Mughal king was Bahadur Shah Zanfar II who was dethroned in 1858 and the British era began.